This is a relatively new webpage to which I am adding international data as I come across it. Contributions, comments and corrections would be very welcome. Different cultures clearly differ in their approach to regulation. Western cultures, for instance, pay greater respect to individual rights than to obligations to wider society. Surveillance, on the other hand, is more accepted in some other cultures, and many communities tolerate village and family punishment of those that step out of line. Justin Webb, writing in The Times in August 2017, commented that "The libertarians squeal but here is the dirty truth: Americans like regulation". Others tell me - and my own experience suggests - that rules tend to be enforced more strictly than in the UK with less room for common sense. All types of law enforcement officers can often appear tyrannical to British eyes, and prosecutors, who have to run for office, can be over-zealous. young people cannot buy alcohol (unless with parental etc. permission) until they are 21 (UK 18, 16 with meals) - and I was ID'd at the age of 67.
jaywalking is often illegal. It is never illegal in the UK, apart from on motorways. On the other hand, US authorities and individuals are often reluctant to interfere in what happens behind closed doors and closed curtains. Perhaps the worst recent example was the failure to inquire into the treatment of the Turpin children who came to public attention in 2018. As one neighbour put it: "We're in California. Everyone's weird. You can't call the police for that. ... People don't want to have community." But some cities have taken quite drastic action in response to falling child vaccination rates. Anyone living in four areas of Brooklyn in 2019 had to be vaccinated against measles or face a fine of up to £1000. It is hard to imagine a similar law being enacted in the UK, which relies instead on persuasion and public spiritedness - which have the advantage that the do not intensify the militant nature of many anti-vaxers. Delaware is famous for having very lax company law. And it is pretty easy to buy and own a gun, so there are around 100 deaths pa per 1 million US citizens (including accidents and suicides). The UK figure is 1. USA over-regulation might be behind signs that the US is over time becoming less entrepreneurial. New Zealand comes first in the World Bank Ease of Doing Business Survey, well ahead of both the UK (7th) and the USA (8th). 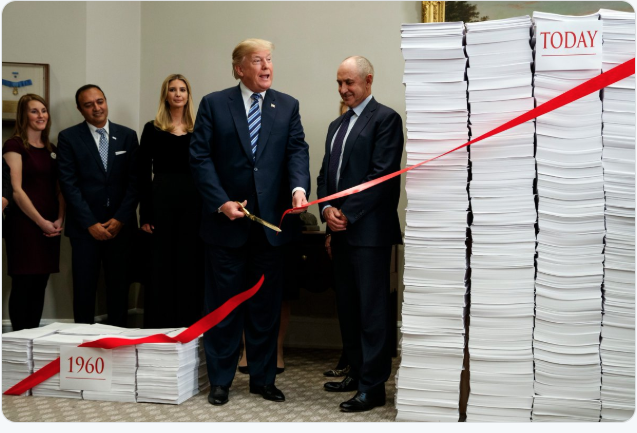 But President Donald Trump vowed to do something about the problem, although critics complained that he claimed credit for the gross cost of the regulations that his administration was shedding, and not deducting the value of those regulations. But much the same criticism was, equally fairly, aimed at the UK's deregulatory efforts - click here for more detail. 'In the 1980s, when the US, as it does today, felt an economic competitor from the Far East breathing down its neck (Japan then, China now), the federal judge Robert Bork oversaw some hugely consequential changes to American competition and antitrust law. Bork argued that as long as prices for consumers kept falling, the consolidation of large companies into near-monopolies posed no problem for competition. The problem with the post-Bork competition law that now obtains in the US, Rana Foroohar argues, is that mega-companies today no longer function like their predecessors. "Their products are often cheap or free," she writes, "so consumer prices should not be the measure of competition," In short, the regulatory architecture has failed to keep up with the evolution of what Rana calls the "superstar company". "regulation has a broader societal purpose. At its core, regulation is a human phenomenon. For this reason, regulators should not confine themselves merely to advancing their statutory objectives. We hold a moral and ethical obligation to initiate bold and courageous action to improve the human condition." An author of one of the papers adds that excellent regulators incessantly probe for "strategic macro-opportunities to create public value, potentially by transforming an entire industry, even an entire economy". This is not a view that would find favour in the UK where most opinion formers believe that (small p) political choices should be made by elected politicians and that the regulatory state may already be far too powerful. It's a gross oversimplification, but there is something in the oft-repeated suggestion that - in countries with a strong Roman Law and/or Napoleonic Code tradition - "nothing is permitted unless it is specifically allowed" whereas - in the UK and USA and Commonwealth countries - "everything is allowed unless it is prohibited". Be that as it may, there are plenty of (to our eyes) entertaining stories of French, Swiss and German over-regulation. One that caught my eye was a €3,000 fine imposed on a French baker who dared open seven days a week. It is true, of course that UK law restricts many shops' Sunday opening but the French law apparently merely required the baker to close on any one day of his choosing.